In its first four weeks at the box office, nothing could come close to Star Wars: The Force Awakens, as it shattered box office records left and right. Disney and LucasFilm's sci-fi adventure has overtaken Avatar as the highest-grossing movie of all time domestically, with a current domestic tally of $812.7 million and a worldwide total of $1.73 billion, which is still nearly $1 billion shy of Avatar's global record of $2.7 billion. As the blockbuster enters its fifth week in theaters, it faces its toughest test against three new releases, Paramount's 13 Hours: The Secret Soldiers of Benghazi, Universal's Ride Along 2 and Lionsgate's animated comedy Norm of the North. According to the projections at Pro.BoxOffice.com, Ride Along 2 will be the first movie to dethrone this box office behemoth, with an estimated opening weekend tally of $47 million. Star Wars: The Force Awakens got off to an incredible start last month with a record-breaking opening weekend of $247.9 million, and its second weekend record of $149.2 million is just as impressive. It dropped just 39.8% in its second weekend, which is incredible for a movie of this size, and 39.5% in its third weekend, setting another record with $90.2 million. Last weekend, it finally suffered a "normal" drop, dipping 53.1% to win again with $43.1 million, but it wasn't enough to overtake Avatar's fourth weekend record of $50.3 million. 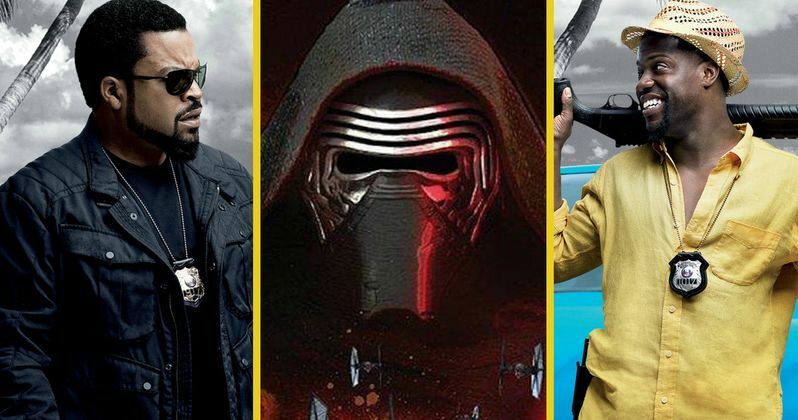 We're projecting that Star Wars: The Force Awakens has another drop of around 50%, for a fifth weekend total of $23.5 million, putting it in second place for the first time, behind Ride Along 2's tally of $47 million. Kevin Hart and Ice Cube lead the returning lineup of Ride Along 2, the sequel to the blockbuster action-comedy that gave us 2014's most popular comedy duo. The story takes Ben (Kevin Hart) and James (Ice Cube) to Miami on a new case. They are joined in the film by Ride Along co-stars Bruce McGill and Tika Sumpter, as well as those new to the series, including Olivia Munn, Benjamin Bratt, T.I. and Olivia Munn. The original Ride Along earned $134.9 million domestically, thanks to a $41.5 million opening weekend back in 2014, while working from a $25 million budget. 13 Hours: The Secret Soldiers of Benghazi is expected to take third place this weekend with $22 million. Directed by Michael Bay, 13 Hours: The Secret Soldiers of Benghazi is the gripping true story of six elite ex-military operators assigned to protect the CIA who fought back against overwhelming odds when terrorists attacked a U.S. diplomatic compound on September 11, 2012. When everything went wrong, six men had the courage to do what was right. John Krasinski, Pablo Schreiber and James Badge Dale lead the ensemble cast in this dramatic thriller. The Revenant is expected to drop to fourth place with $20.1 million, with newcomer Norm of the North rounding out the top 5 with $11.5 million. The Revenant is an immersive and visceral cinematic experience capturing one man's epic adventure of survival and the extraordinary power of the human spirit, based on a true story. In an expedition of the uncharted American wilderness, legendary explorer Hugh Glass (Leonardo DiCaprio) is brutally attacked by a bear and left for dead by members of his own hunting team. In a quest to survive, Glass endures unimaginable grief as well as the betrayal of his confidant John Fitzgerald (Tom Hardy). Guided by sheer will and the love of his family, Glass must navigate a vicious winter in a relentless pursuit to live and find redemption. The Revenant opened with an impressive $474,560 from four theaters during its Christmas weekend debut, with a stellar $118,640 per-screen average. What's even more impressive, though, is it barely decreased at all in its second weekend in limited release. It earned $447,829 from four theaters for a $111,957 per-screen average, a decrease of just 5.6%. The critically-acclaimed film has earned $41.3 million domestically and $61.8 million worldwide, but it still has a bit of work to do to earn back its $135 million budget. The stereoscopic 3D animated family film Norm of the North tells the story of the titular polar bear and his three Arctic lemming buddies, who are forced out into the world once their icy home begins melting and breaking apart. Landing in New York, Norm begins life anew as a performing corporate mascot, only to discover that his new employers are directly responsible for the destruction of his polar home. The voice cast is lead by Rob Schneider, Heather Graham, Bill Nighy, Ken Jeong, Zachary Gordon, Colm Meaney, Loretta Devine and Gabriel Iglesias. Rounding out the top 10 will be Daddy's Home ($8.7 million), The Forest ($6 million), Sisters ($4.3 million), The Hateful Eight ($4.1 million) and The Big Short ($3.9 million). Opening in limited release this weekend is Gravitas Ventures' Band of Robbers, Samuel Goldwyn Films' The Benefactor and China Lion's Detective Chinatown. It isn't known if any of these titles in limited release will expand nationwide next weekend. Looking ahead to next weekend, three new releases will vie for the box office crown, Sony's The 5th Wave, STX Entertainment's The Boy and Lionsgate's Dirty Grandpa. Also opening in limited release are Well Go USA's highly-anticipated action sequel Ip Man 3, Magnolia's Synchronicity, FilmRise's Monster Hunt, which is the most successful movie ever in China, Lionsgate Premiere's Exposed, Freestyle Releasing's Caged No More, Big World Pictures' Aferim! and A24's Mojave. Be sure to check back on Sunday for the box office estimates, and again on Tuesday for next week's predictions, but until then, here's our projections for this weekend at the box office.